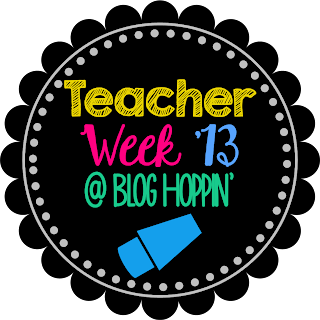 Today I am linking up with Blog Hoppin' for Teacher Week 13! Today's topic is called Taming the Wild: Classroom Management. If you click on the button below you can head over there and see who else has linked up ! It's already getting pretty late so I just have two ideas on Classroom Management right now for you - but ironically I had started a blog post on one of them and written down the name of the other for a topic. For years I used the traffic light behavior system and it worked well, generally (there are of course exceptions). I also happened to be on a webinar last week hosted by Laura Candler and she was discussing how she uses it and it sounds more detailed than what I had done. If you're interested, I'd recommend heading to her blog here to see what you can find. In any case, I used the 3 color system: red, yellow, and green. I couldn't find a picture of mine but I did find an example at Mrs. Lawrence's weebly page. I don't know her but she deserves a shout out for providing an image. I put little velcro pieces on each color and made a tag for each child. Every morning they all started on green and most days most children's tags stayed there. If they were on green at the end of the day they would earn a prize ticket which would go in a big jar. Once a week I would draw a ticket and that child would win a prize. The more times they stayed on green, the more tickets they got, and the more chances they had to win a prize. 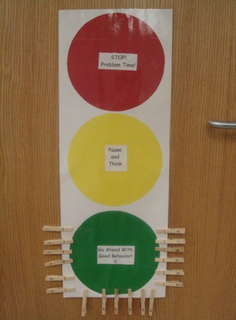 Students would go on yellow for smaller problems, usually after I would have spoken to them once or twice, and if things did not improve, they would go on red which would lead to to a phone call home or their parents coming in, me talking to the principal, and various other things like that. It worked well overall for quite a few years. Last year in the late fall I learned about Class Dojo from my colleague Kim. She had been using it for a few months and I was fascinated. I decided to give it a try. Class Dojo can be used via their website which I used for managing it but for my class I downloaded the app and projected the app from my ipad onto our classroom tv (which we just got last year too, YAY!) Class Dojo basically gives each student an avatar. The students then can earn or lose points based on different behaviors which you customize. I then assigned certain "prizes" or things children could earn when they got to certain point levels. For example, I assigned every child the same avatar but if they earned 10 points in a day they could choose their own avatar and keep it for a week. They loved it ! I was able to reinforce positively behaviors like being on task, putting effort into work, and turning in homework. Other behaviors were able to be addressed like being disruptive and having trouble outside of the classroom like at recess. Here's a picture from the website which shows you some of the cute avatars that you can use. This is a close up of a couple designs for avatars. There are other colors besides pink! Here is a shot from the website. There is a demo class you can use to learn how to use it and show your class how it works and then you customize your own class. I will be doing a lengthier blog post on Class Dojo but I really really love it! I am excited to use it again this year from the beginning of the school year. Check it out! Also, my bloggy buddy Christina is having several awesome giveaways to celebrate her 400 followers. A new one starts each today. today is MATH! Check out all the great prizes at her blog - just click the button below to go there (and there might be a big product donation from me one or more days :) )! Click on any of the images below to go to her blog and enter! Thanks Kim! Im going to peek at your blog right now! Cute name! I really need to look into Class Dojo. I have not used it but any positive reinforcement would be wonderful! Thanks for sharing! I ADORE Class Dojo, and so do my kids! It's the best thing ever! Oh, I love your blog! So cute! My First Monday Made it Linkup! 5 for Friday Linky Party Time!